Bag ladies: what handbags are you lusting over? Thought it would be fun to post a side by side comparison of my two style personas...the dark UWP side and the bright colorful side. Previously I always thought of my dark side as my shadow style, but now I can't tell which of them is my primary style anymore...I think they both are! Both sides are ladylike and polished and matchy matchy, but one side is a little more floral and pretty and the other side a little tougher and more badass. I dress according to my mood, whether I'm feeling more whimsical or edgy. Anyone else have a dual style persona? Great ensemble Angie! I was able to shop my closet for all of these items. Ms. Scarlet had to come out to play. 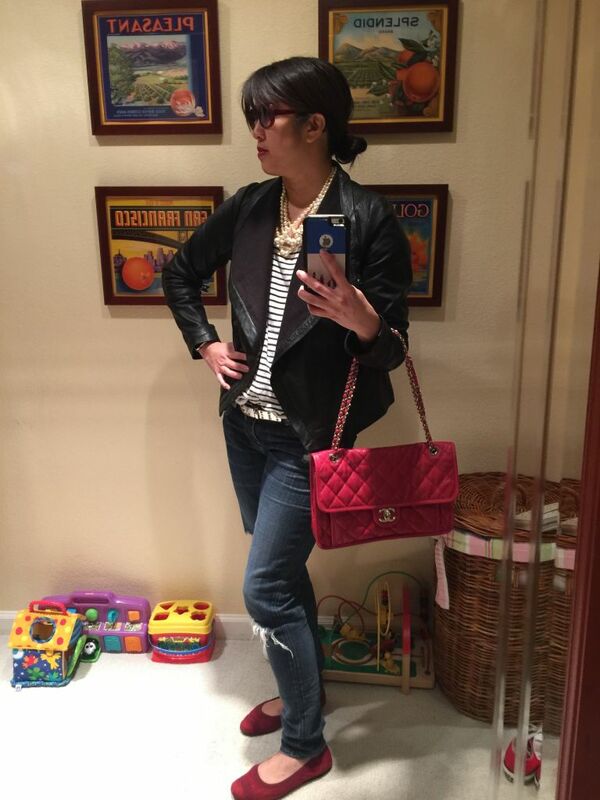 I felt very Parisian chic with the pearls and stripes! Of course I had to copy the Pinterest model pose too. Which do you like...red ballet flats or Converse? And tucked or untucked shirt? Just for fun! What bags are you currently lusting over? Can be anything from recent/planned purchase to dream bags, practical to fantasy. I have been wanting to get an oxblood colored bag. I have a red Fossil tote that is very old and beat up that I still use. 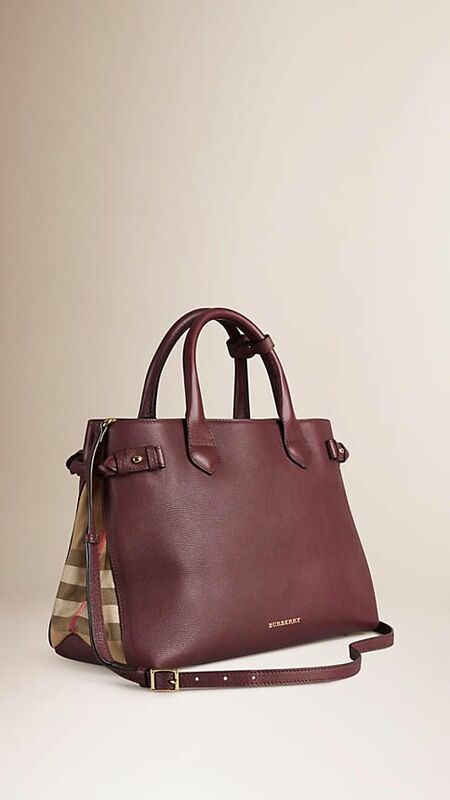 I would love to replace it with this Burberry tote. Love that there is just a hint of the Burberry check peeking out from the sides. Love the mahogany color. It is quite expensive though and I'm not sure if it would be big enough to hold my laptop. There's another oxblood leather tote from a company called Dagne Dover that makes very stylish and functional totes with lots of organized compartments. The leather one is vertical and $495. There's a cheaper coated canvas horizontal tote for $255-$265 (13 vs. 15 inch), I like the bright blue color (they do also make an oxblood color). Undecided about which size or style would fit my needs, and not sure it's worth the price (love the leather version but $495 is still pretty expensive...). What do you think of these bags? 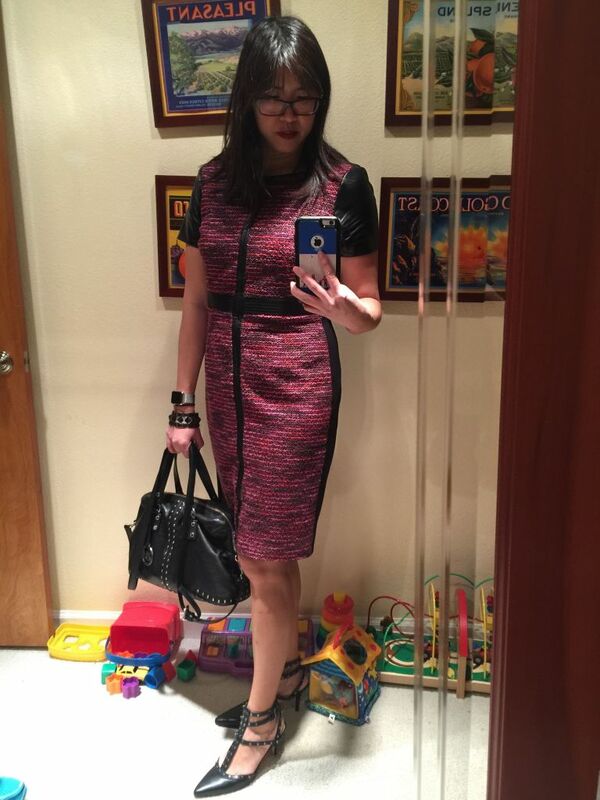 I haven't been dressing up as much lately (see my workout gear post), but I still like to once in a while! 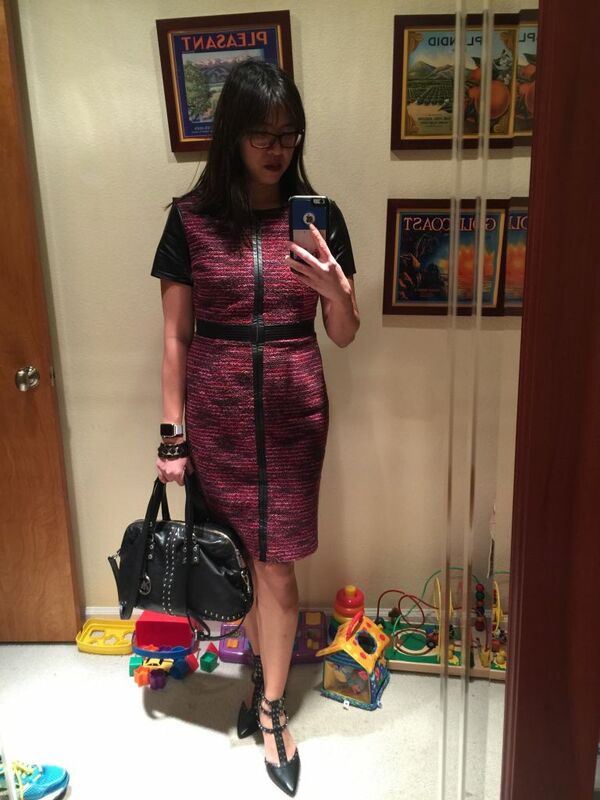 Lots of compliments on the Valentino knockoff shoes. Love the matchy matchy-ness of the studs on the shoes and purse. Leather and studs too risqué for work? Not if you're the boss! Hi all! I haven't been around as much here lately because I started exercising two months ago. I've been living in comfy cardigans and workout wear and don't really have the time or effort to post outfits. But I thought you would like to see what I've been up to, even if it's just "gear". I never really had to watch what I ate or exercise in the past (I was so busy with work and the kids and was pretty much nonstop nursing for the past eight years, so that was my "diet/exercise program"!). But I gained 15 lb over the last year after I stopped nursing and the 40's metabolism finally caught up with me. I was already an apple but my belly got even bigger. Five of my patients asked me if I was pregnant. That was the last straw! I resolved to get in shape. I signed up for a trial of The Dailey Method, which is a barre class, and went nearly every day for a month. The first few times were so tough--my thighs were shaking trying to do all those squats and leg lifts! But I slowly got stronger and now can do plank walks and full pushups! This past month I joined a gym called OrangeTheory Fitness, where you run on a treadmill, row and do other weight exercises and your heart rate is displayed on a monitor the whole time so you can see how hard you're working. You have to go in cycles from base pace to push pace and then run "all out" for 30 sec to 1 min. I'm going from 5 miles to 6.5 miles to 8 miles per hour and am dying at that point...I'm sure the others are looking at me because I'm breathing so hard! I really have to plan ahead to fit the exercise into my day, and rely on my husband and nanny to help out with the kids while I'm exercising. But I think it's worth it. OTF is a great cardio workout and Dailey Method is a great core/toning workout so I think I'll stick with a combination of both. I still go to Dailey Method with some other mom friends on Saturdays whenever we can--the kids get to play together at childcare at the studio and then we go to the park nearby afterward. A mommy exercise playdate! I'm still working on the diet...trying to curb my candy/sweet tooth and cut carbs. It's tough though! I have lost about half of the weight I gained and hoping to continue to make progress. I am also starting to notice some taming of the "food baby". Still an apple for sure, but hoping not to be a puff pastry anymore! I haven't bought much in the way of real clothes lately, but instead have amped up my workout wardrobe with some cool new gear. 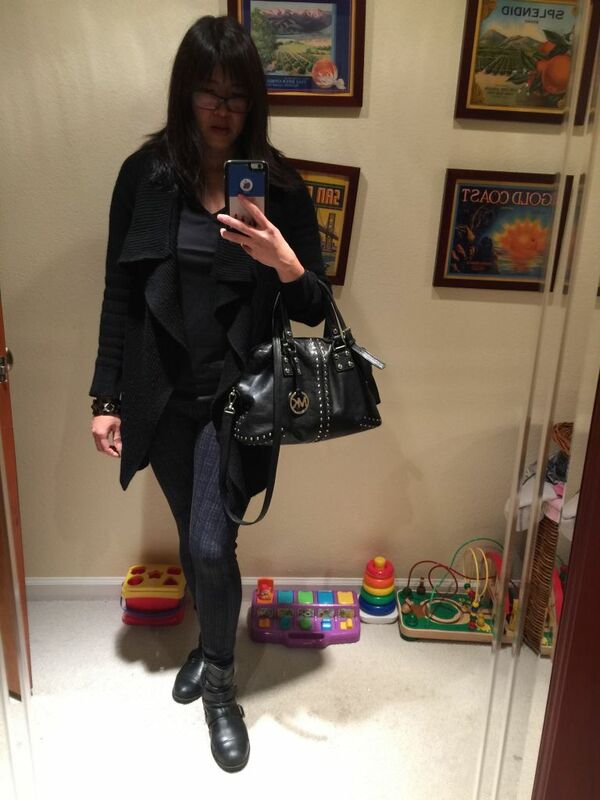 #1/2 is my fave because it looks like a real outfit with the zippered houndstooth leggings, but take off the cardigan and boots and I'm totally ready to work out! I also got an Apple Watch for Christmas and am having fun with the Activity Tracker function. Thanks for looking and for your encouragement! This is hard but I'm trying to get healthier, both for me and for my family! 6. American Giant hoodie, Gama Go Ninja Kitty T, Zella leggings. 7-9. Dailey Method. Love the grippy socks that give you pep talks. I also like that they have childcare during some of the classes.